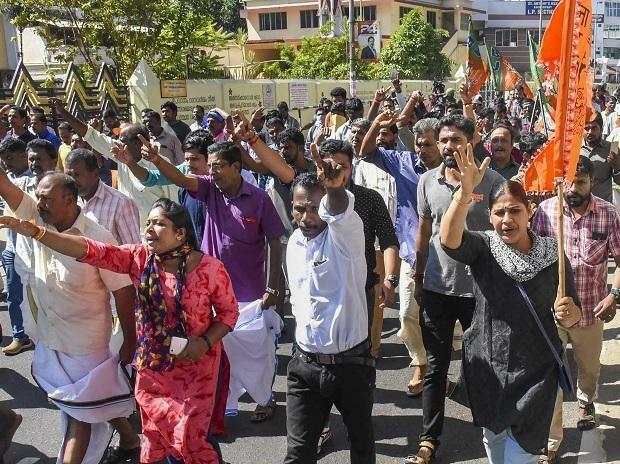 Kerala was in ferment on Thursday, a day after two women of menstruating age entered the Sabarimala temple, infuriating saffron outfits, with protesters blocking roads by placing burning tyres and granite blocks, and clashes leaving three BJP workers injured in a knife attack, officials said. Most state-run buses kept off the roads after several of them were damaged in Wednesday's violence, while only a few autorickshaws plied in cities and towns. However, Chief Minister Pinarayi Vijayan told media that the man, Chandran Unnithan, died due to cardiac arrest. As tempers ran high in Kerala, the Supreme Court Thursday refused to urgently hear a contempt petition moved by a lawyers' group against Sabarimala temple authorities for closing the shrine for purification after two women entered it. Advocate P V Dinesh appearing for Indian Young Lawyers Association told the bench that the temple authorities closed the shrine Wednesday for purification after the women's entry which was in violation of the apex court verdict. "There was a clear planning to the violence unleashed by the hartal supporters. Since yesterday, there has been so much violence. Media personnel, including women, and police were among those attacked," Vijayan said. Seventy-nine state transport corporation buses were vandalised and 31 police personnel injured in the violence, he said. "Most of those attacked were women. Many shops have been damaged by Sangh Parivar. Offices of CPI(M), CPI have been vandalised and attacked in the state," Vijayan said. Police used batons and water cannons to break up protests. Journalists staged a protest march in the state capital after they were allegedly assaulted by protesters. The state's police chief Lok Nath Behera said a special team will probe the assault on media. However, defying the 'Hartal' call, some shopkeepers opened their establishments on SM Street, a major trade hub in Kozhikode, besides a few places in Kochi and Kollam under police security. Some Youth Congress workers were injured when they were hit by the pilot vehicle of the chief minister's convoy while they attempted to show black flags to Vijayan. The Congress is observing a 'black day' against the entry of women into the Sabarimala shrine, the abode of its perennially celibate deity Lord Ayyappa. Bindu and Kanakadurga, two women in their 40s, had defied dire threats from saffron organisations and offered prayers at the temple that was out of bounds for girls and women between 10 and 50 years of age, breaking the centuries-old tradition and infuriating the Hindu right. Scores of protesters were arrested from different parts of the state for breaking the peace. The state's universities postponed the examinations scheduled for Thursday.